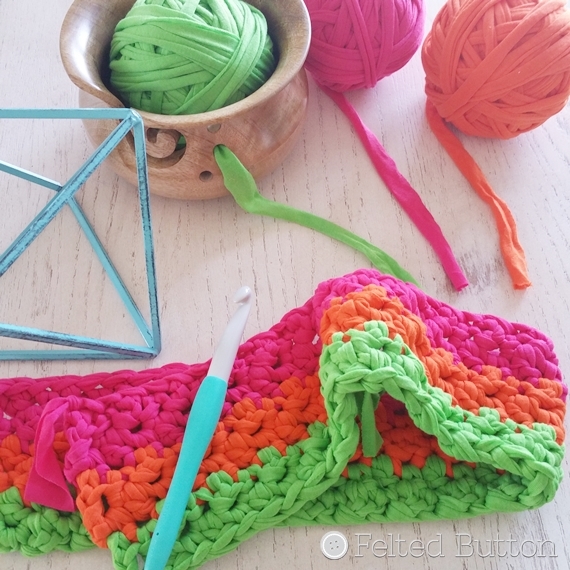 You might remember this post about all of my recent crochet WIPs. 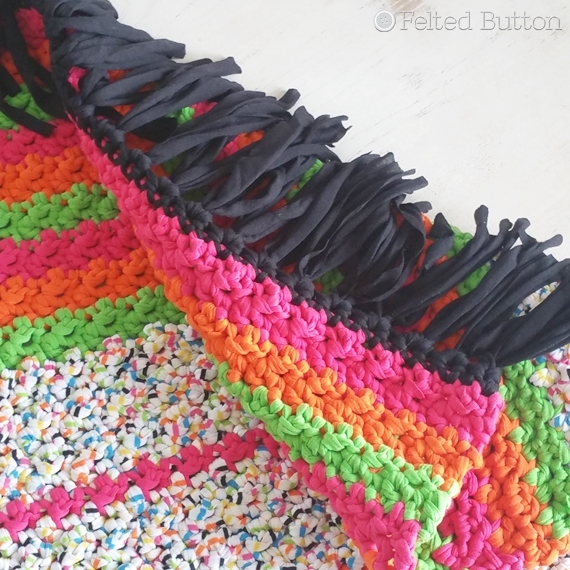 Well, I've got one to share with you today--and it's a free pattern! because the stripes and colors are so reminiscent of those licorice all-sorts candies that I used to find at my grandma's house. But, I figured if you wanted to make it in your own colors to suit your style and space, the name wouldn't limit your imagination. 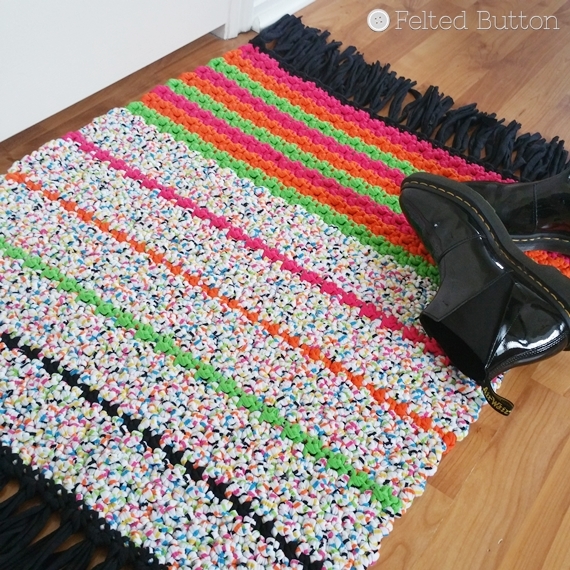 And the rug could be used in "all sorts" of spaces--kitchen, bath, entry, nursery, bedroom, etc. Let me tell you the beginnings of this design, and then we'll get on with the very simple pattern! When I got my "hook" into this *Scheepjes Nooodle yarn, I was delighted. It is SUPER soft with no drag on your hook and fingers when you work with it. Because it is a super bulky yarn, however, my hands did get a bit tired, so I worked in little bursts rather a couple marathon sessions. The yarn is a 50/50 cotton/polyester blend so will be perfect for durability and washing--precisely why I chose to make a rug with it. I think it would be splendid for baskets, hanging organizers, footstools, or pet beds, too. I see a cat cave or dog bed in the future for me using this yarn. If you noticed the yarn bowl in the above pic--you've got eyes like mine for all things yarn-loving. Here's a better view of it. 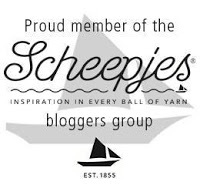 It was a sweet Christmas gift from my friends at Scheepjes last year. 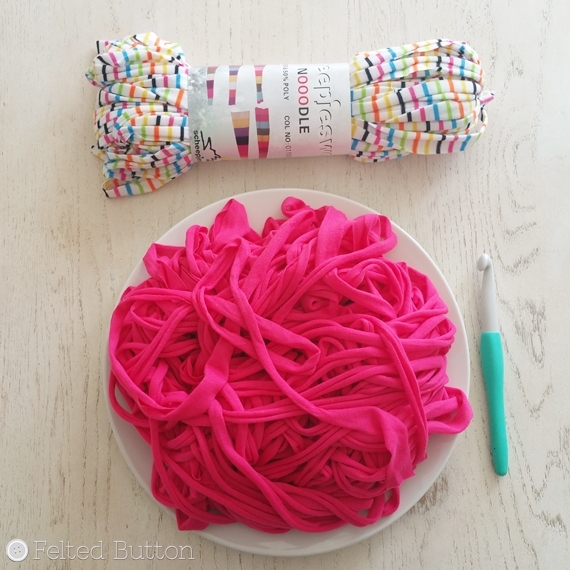 It's brilliant for keeping yarn clean and untangled with no "rolling" balls. Plus, it's pretty. You can get your "yarn" into it from Deramore's *here. So let's get the rest of the details. Notes: I haven't used any fancy techniques here. I suggest working into the back bump of your foundation chain across in order to leave the remaining two loops free--a tidier option in my opinion. You can make the color changes wherever you wish. I changed colors at the end of designated rows (see below) by fastening off and beginning the next row by joining with a sc. Remember, you can always adjust the dimensions of the rug to suit you. The multiples is 2 +1. Simply work the chain to your desired width in multiples of 2 then chain 1 more. 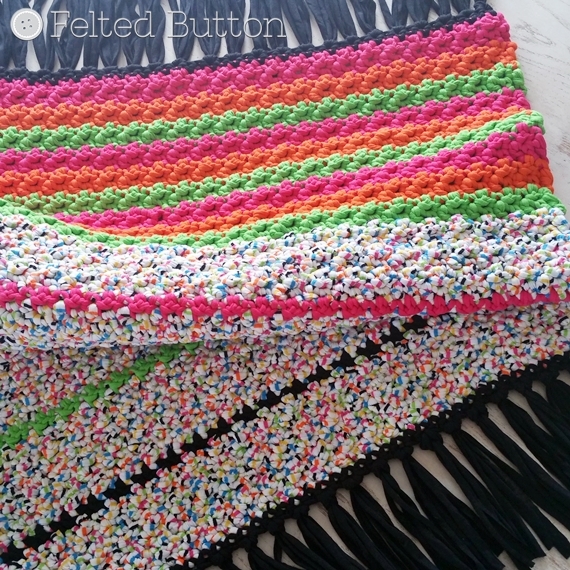 You can work as many rows as you want, too, by just repeating Row 2 to the desired height. Rep Row 2 following the color changes below or until the rug reaches the desired height. Weave in those ends!! I used my hook here, since I didn't have a yarn needle with a large enough eye. But it was speedy quick, so no complaints. I wrapped the black yarn around my little 8in/20cm wide polka-dotted notebook a couple of times to get the length I wanted--about 16 inches/40cm long. Cutting on one edge I was left with 2 16in strands of the yarn for each tassel, since it's full enough with just that, I think. And then I folded both of them in half to make a loop, drawing the loop through every other sc at the edges of the rug with my hook. Then I fed the tails up through the loop and pulled it tightly. They are pretty snug and I'm happy with them. Simple is good, right? I hope you enjoy this pattern. 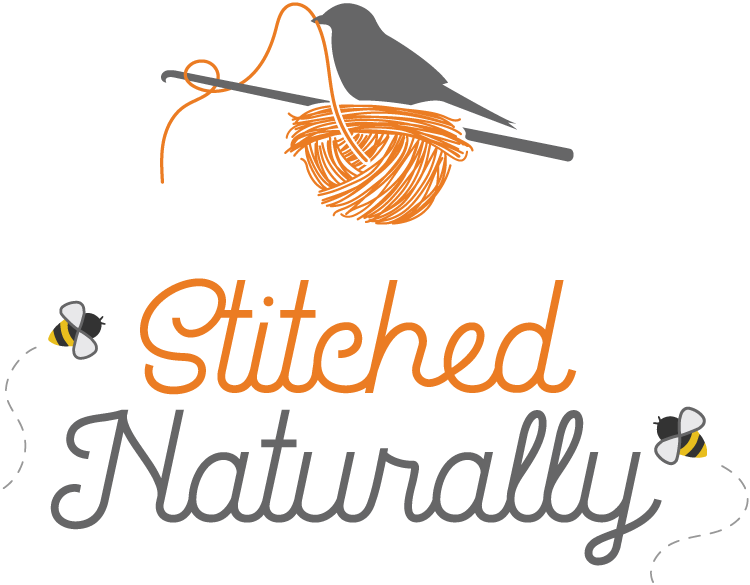 If you would like to have an ad-free tidy printable PDF, you can find it for download in my Ravelry shop for $2 here. 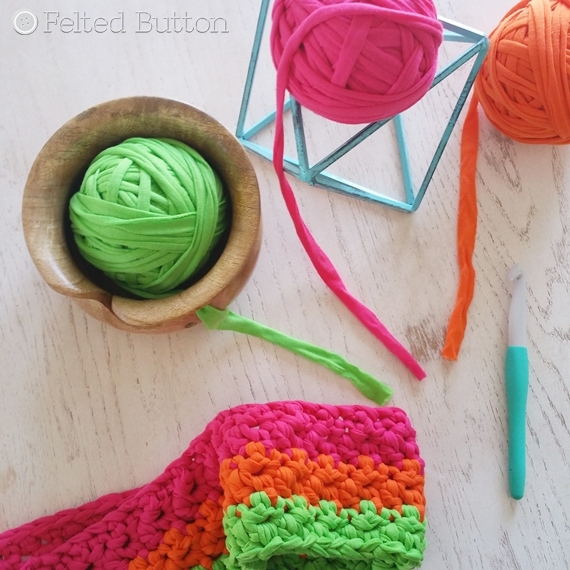 You can share what you make with this pattern on my Facebook page here and connect with other like-minded crochet addicts on Instagram (@FeltedButton), too. So many fun things are happening around here. I'll share as soon as I can. * This post contains affiliate links. Thanks for your support. Thank you for this nice pattern!